Adding rosemary to desserts and baked goods is a trend that’s on the rise, according to Technomic’s MenuMonitor data. 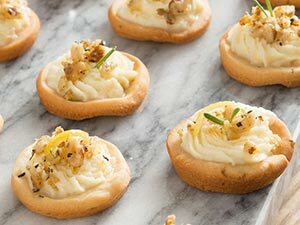 Here, the piney herb is used fresh, both in the honey-sweetened dough and in the gremolata that garnishes the cookies. 1. For shortbread, in mixer bowl, cream butter, honey, rosemary and salt for 2 minutes until well blended and fluffy. Add flour, ½ cup at a time, beating well after each addition until all is incorporated. 2. Remove dough from bowl; place on floured surface. Form dough into a disk; wrap in plastic wrap and refrigerate 30 minutes. 3. Preheat oven to 350 F. Remove dough from refrigerator and place on floured surface. Roll out dough to ¼-inch thickness. 4. Using a 1½-inch round cookie cutter, cut out dough. Place rounds into bottom of mini muffin pan, lightly pressing dough into corners. Bake shortbread 15 to 20 minutes or until very lightly browned; cool in pan 10 minutes. Remove shortbread from pan. 5. Meanwhile, prepare filling: In small bowl, fold together honey and mascarpone. Place mixture in small piping bag. Pipe or spoon mixture into shortbread rounds. 6. For gremolata, in bowl, combine walnuts, rosemary, lemon zest and olive oil. Spoon a little gremolata on top of each cookie.